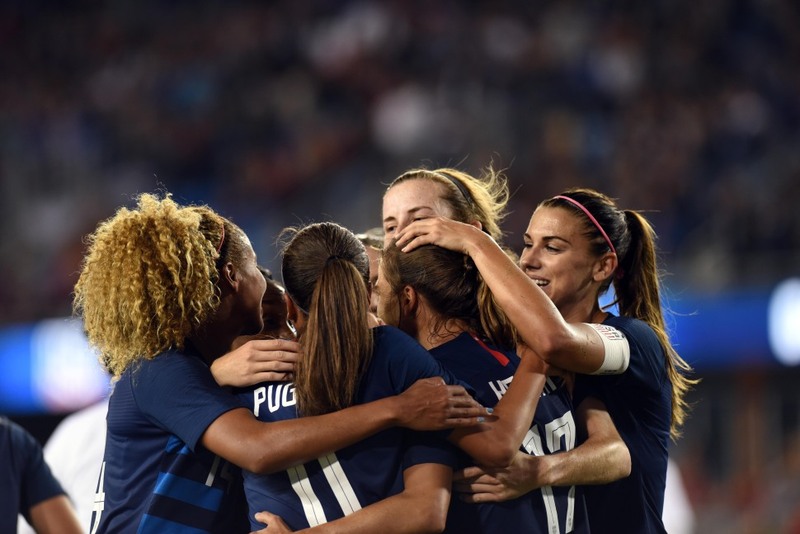 The women of the U.S. national soccer team played one more match in the South Bay before heading off to the 2018 CONCACAF Championship which will serve as the qualifiers for the 2019 World Cup. The Americans scored goals in so many ways over the past week. Now it's time to do it on the big stage of World Cup qualifying. Carli Lloyd entered in the second half and immediately scored on a diving header before scoring again in the 93rd minute after a dazzling dribbling sequence for her 102nd career goal, and the U.S. women's national team ran its unbeaten streak to 21 matches by beating Chile 4-0 on Tuesday night in the second exhibition between the countries in five days. "I think Chile was a good opponent for us going into the CONCACAF qualifying. I think that they're pretty similar to the teams that we're now going to face that we know of," Lloyd said. "So two good matches, a lot of players got time, we scored some great goals. I think we can go into qualifying confident and ready." Tobin Heath scored a goal and assisted on two others as U.S. coach Jill Ellis used the friendlies against Chile to mix and match with a variety of veterans and young players. Mallory Pugh scored in the 34th minute on a pass from Heath before Heath scored her 21st career goal four minutes later. Lloyd headed in a goal from just outside the 6-yard box in the 47th minute off Heath's free kick. With her 101st goal for the national team, Lloyd moved into fifth place on the Americans' all-time list, passing Tiffeny Milbrett. "She came in and was a game-changer," said Ellis, who was thrilled to see a balanced effort by her players as "we shared the load, which was important to me." Pugh got the Americans on the board with her 12th career goal in a whirlwind sequence after Alex Morgan's penalty kick was stopped by Chilean goalkeeper Christiane Endler. The ball deflected to Endler's right, where Heath secured it and crossed as Pugh scored from a couple of yards out. Chile defender Camila Saez tackled Pugh for the penalty kick. Tierna Davidson, a 19-year-old star from the Bay Area who is a junior playing at Stanford, assisted on Heath's goal after scoring her first career goal in a 3-0 win against Chile on Friday night at Carson, California, in her 11th appearance with the national team. This was the Americans' final tuneup ahead of the start of World Cup qualifying next month and drew a crowd of 14,340. These were the first two matchups between Chile and the U.S. The Americans had another first-half chance in the ninth minute, when Morgan's cross to Pugh led to a one-touch shot from a few yards out that sailed high over the crossbar. U.S. midfielder McCall Zerboni went down in the opening minute with a left elbow injury and trainers took her off the field before she was replaced by Morgan Brian in the fifth minute. Zerboni will be re-evaluated soon. The U.S. team played again without midfielder Megan Rapinoe, who is nursing a rib injury but is expected to be healthy for World Cup qualifying. Rapinoe has worked to raise more than $150,000 to aid victims of the devastating Carr Fire in her native Redding, California, area, and at least 65 people from Redding attended the game in a joint effort with U.S. Soccer and the Shasta Regional Community Foundation, which organized buses to transport the fans. "It's so great, it's amazing," Rapinoe said. It was a homecoming of sorts for several of the Americans on a gorgeous night at the San Jose Earthquakes' Avaya Stadium, including defenders Abby Dahlkemper and Davidson, who are from nearby Menlo Park and were in the starting lineup for Ellis. Also starting were midfielder Julie Ertz, who played collegiately a few miles away at Santa Clara University, and forward and former University of California star Morgan. Chile has already qualified for next summer's World Cup in France to make its debut in the tournament, earning a second-place finish in the Copa America to secure a spot. The American women, who played for the fourth time at Avaya, are 18-0-3 over the past 13 months and 11-0-2 in 2018. "I love this place," Ellis said. U.S. defender Kelley O'Hara played the initial 30 minutes as planned as she works back to more minutes from a hamstring injury.